Graham Hodge - Horror Author. Objects that are said to be Haunted or Possessed. Part One. Throughout the ages of history there have always been objects that people have claimed to be either haunted, possessed or that hold special powers, objects that people have owned but have come to fear. Here we will look at some of these objects that are said to be possessed by an evil spirit, haunted or have been cursed. Many popular horror films have featured children’s dolls that move from the chair in the corner of the bedroom as the frightened child lays in bed afraid to look, but there have been many reports of these children’s toys taking on a life of their own. Robert the Doll is one such toy. Robert Eugene Otto was born in October 1900 to a wealthy and successful family living in Key West, as with many wealthy families of this era the Otto household employed a number of servants from the Caribbean and the Bahamas. Robert Eugene Otto being an only child was cared for by a nanny who is believed to have originated from the Bahamas. By 1904 when Gene as he was referred to by his family was four years old, the nanny had become dissatisfied with her role and the way she was being treated by the Otto family. The Nanny who is supposed to adept in the arts of Black Magic and Voodoo made a doll out of wire cloth and straw and even used cutting from Gene’s own hair for the hair of the doll. The nanny made a nice sailors outfit for the toy to be dressed in, and once complete she gave the doll to Gene as a present. The doll had a remarkable likeness in looks to Gene and he took to the toy immediately. Gene called the doll Robert after himself and would take the doll around with him whenever he was home, the family would hear him talking away to Robert but thought nothing of this as most children of Gene’s age would have an active imagination and pretend that they can talk to their toys and imaginary friends. However the family started to hear a strange spine tingling giggles coming from a room that no one other than the doll was in, it would also happen as Gene was talking to the doll so he could not have made the laughter at the same time. The family got more suspicious that something was not right when they started catching glimpses out of the corner of their eye of the doll darting from room to room. Things became a little more concerning for the Otto family when several neighbours reported to Mr and Mrs Otto that they had seen the doll moving from window to window, what made this more worrying for the Otto’s was that many of these sightings by the neighbours were at times when no one was in the house. The family also swore that the dolls facial expression would change while you were looking at it or that Robert would even wink at you. Gene however adored the toy and his attachment to it grew as time went on. The family would often be woken up in the early hours of the night by Gene screaming and crying, as his parents would run into his room to see what was wrong, they would find furniture in the room knocked over and room in disarray. The boy would be curled up in terror on his bed while Robert would be sitting on the edge of the bed gazing at the doorway where the Otto’s were standing. Once they had managed to calm down their son, they would enquire what the matter was and what had happened to his room. Gene would just point at the doll and say “Robert did it”. As the months and years went on Robert was blamed for all the wrong doings that Gene was suspected of doing. The doll remained a companion for Gene even into adulthood, as an adult Gene lived a solitary life for a while, keeping himself to himself, remaining in the house and not often venturing out, but one day he did meet a woman who he was to fall in love with and they finally got married. Anne moved into the Otto house once they were married and for a time everything appeared ok, but as time passed Anne and Gene would argue a lot more and Gene became prone to fits of rage and anger. After the argument when the couple were making up and discussing the argument, Gene would always blame his behaviour on Robert. Years moved on and Anne grew tired of her husband’s childish behaviour and attachment to the doll and decided to relegate the toy to the attic. However neighbours and children would often make comments about how they had seen the doll looking out turret window, children would be scared while playing in the street saying the doll was watching them, Gene who insisted that the doll was in the attic so could not be seen in the turret window finally went up to investigate, even he was surprised when he found the doll sitting and rocking back and forth in a rocking chair at the window of the turret room. The doll was placed back in the attic but each time it was, Robert managed to find his way back to the rocking chair by the window. Living with Robert and Gene had its toll on Anne and she was finally diagnosed as officially being insane, not long after her diagnosis she passed away. Gene was once again alone with Robert and once again he became the recluse. Robert was brought back out of the attic and Gene decorated a room and filled it with furniture for the doll. On the death of Gene the house remain empty for a while until it was finally bought in early 1970’s by a family. The new owners of the house had a 10-year-old daughter and while moving in she found a toy that had been left behind by the previous occupants. It was not long before the parents of the young girl started to be woken up in the early hours of the morning by the screams of their daughter, they would run into her room to find everything had been turned over and their little curled up in a tight ball shaking and crying, her explanation for the mess her room was in was “Robert did it”. As time went on, the relationship between the young girl and the doll deteriorated, the girl would tell her parents that the doll would attack her and that she felt the toy wanted to harm her, Even to this day she still recalls how she felt the doll wanted to cause her harm. Robert was finally removed from the house and his new home is in a glass case at the East Martello Museum in Florida. Today Robert’s features are reported to have changed over the years, his hair is said to have become much greyer. Staff at the museum have often reported that Robert has moved position in the case or that his head has turned to look in a different direction or the expression on his face has altered. ask for his permission beforehand, this may sound a little strange but even to this day, Robert has powers that cannot be explained, people who have taken pictures of Robert in the cage without first asking his permission, have reported their cameras malfunctioned or the pictures did not come out. Legend has it that you put yourself at risk of grave misfortune if you do not first request Roberts’s permission to photograph him. How much of the above is real and how much is made up or Chinese whispers is hard to say for sure, but there must be something to the tale because even over 100 years after the dolls creation it is still the subject of reports of strange or paranormal activity. In 2005 the then president of the United States of America, George Bush sent a letter to Robert the doll, congratulating him on his 101st birthday. To this day the East Martello Museum receive letters addressed to Robert form all over the world. 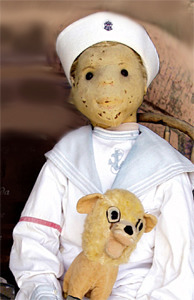 Robert the doll is said to have been the subject and influence behind Chucky, the star of the Child’s Play Franchise.